Putting humanity to shame, it was greed for easy money which killed an eleven-year-old Sushant Arora who was kidnapped and killed on June 12. The mastermind of the murder is none other than a face well known to the family, their immediate neighbour Prince. 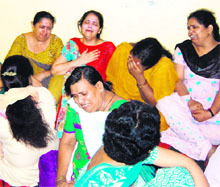 A pall of gloom descended on the narrow lanes of Gate Hakima area as the family of Sushant Arora and residents received the shocking news of his murder. The parents were inconsolable. Sushant's four-year-old sister could make little of why her house was crowded. 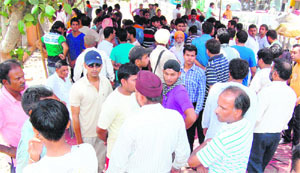 The residents of Gate Hakima area have become fearful for the safety of their children following the shocking kidnapping and murder of Sushant Arora. Living close to the infamous Angarh are, they feel that they could be targeted by criminals living in the area. The district administration today swooped down upon those indulging in illegal sand mining by conducting surprise checks at various villages falling in the periphery of the Ajnala sub-division. Led by Deputy Commissioner, Rajat Aggarwal, and the Senior Superintendent of Police (Rural), Pritpal Singh, the team found that illegal sand mining was being carried out on private property where quarrying was not allowed. 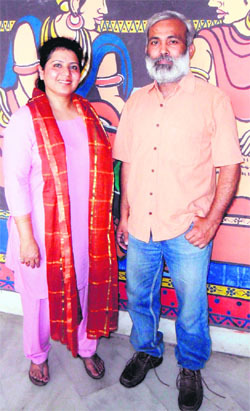 “I believe that Gandhari made a big mistake by deciding to live blindfolded all her life as otherwise she could have given better upbringing to her sons and averted the war that destroyed the entire family,” says Aishveryaa Nidhi, noted actor and theatre person who is in city to stage her play, Gandhari. Horticulture experts from Punjab Agricultural University, who are on their visit to the Golden Temple to revitalise the three sacred trees --- 'Ber Baba Budha Sahib', ‘Dukh Bhanjani Beri' and 'Illaichi Beri', advised devotees against touch these trees with greasy hands. The team comprising Dr Paramjit Singh Aulakh, HoD (Horticulture), Dr Desraj, both from PAU, Ludhiana, and Dr Narinder Pal Singh, PAU wing, Amritsar, earlier got the branches of infested shoots pruned and sprayed insecticides. Though the fire has been extinguished at the Khanna Paper Mill stockyard, the MC has kept four fire tenders stationed at the mill as a precautionary measure. 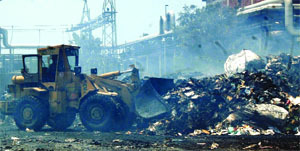 A massive fire at the mill stockyard destroyed raw material worth crores of rupees. For sceptical or plain lazy weight watchers, the motivation for losing weight doesn’t come in hard gym workouts. But they seek solace in popular diet programmes, mainly ‘discovered’ on the Google. Prince involved five of his relatives in this heinous crime. While Prince is yet to be brought to justice, the police arrested five other accused, including a woman. What unfolded is a story of nerve-chilling horror. The child was strangled to death on the same day that he was kidnapped and the body was dumped in the UBDC canal. The Khalra police in Tarn Taran found the decomposed body yesterday. In another example of sheer callousness, the police cremated the body taking it as unclaimed thus depriving the family of even performing the last rites of their loved one. The accused except the woman are all in the age group of 25 to 30 years. Prince, aged around 25 years, not only kept visiting the family to console them throughout the ordeal but also gave the accused all details about the steps taken by the police. The child was killed on the same day and a ransom of Rs 1 crore was asked five days later. When the father showed helplessness in arranging the same, the accused listed the property owned by him, his brothers and other relatives, a fact well known to Prince. Prince even accompanied victim's relatives to get an FIR registered. The accused admitted that they took the boy to the residence of Sarabjit Kaur at Dhapai from where they made the call for ransom to the family. The police had traced the location of the first call from the same area. The boy was killed at the same spot. The district police led by SP (D) HS Brar reached Tarn Taran following circumstantial evidence. The police claimed they had traced the location of mobile phone being used to for extortion with the help of telecom companies and technical experts. The police zeroed in on Prince and his associates through the SIM cards the accused used to call up the parents of the victim for ransom. The accused admitted that ransom was their only motive. The victim's father Sunil Arora told The Tribune that after five days of the kidnapping, the accused demanded Rs 1 crore as ransom to release Sushant. The amount was later slashed to Rs 50 lakh when he pleaded repeatedly. Since Prince, the main accused, knew all about the family, the accused detailed them about all the properties of Sunil's brothers and relatives. * The police said every time, the kidnappers made calls they used a new mobile phone and a new SIM card procured by the accused on fake identity proofs. Even the mobile phones used by the accused were stolen. The accused made two calls on Saturday to demand Rs 1 crore ransom. * The calls helped the police zero in on Prince and his accomplices. * Sushant’s family had not receives any call from the kidnappers till June 16 which had got the police department worried besides delaying the investigations. * Though the family expressed satisfaction with the working of the police throughout the nine-day investigations, several questions still remain unanswered. * The cremation of the child's body by the Tarn Taran police declaring it unclaimed points to a serious lapse in the functioning of the police. * Ironically, both Amritsar and Tarn Taran police deny any lack of coordination between them. * “We presumed that the boy was alive and made all efforts for his safe release. The entire team, including me, worked 24X7 to crack the case. 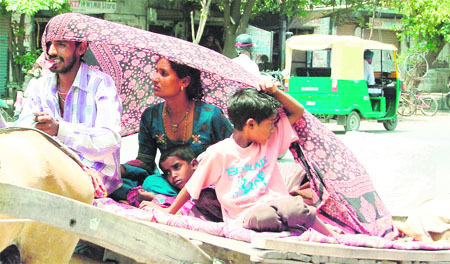 But unfortunately, the boy was killed on the same day when he was kidnapped,” Police Commissioner RP MIttal said. * On the other hand, a senior police official of the Tarn Taran police said the body was so decomposed that it could not be kept any longer. So, the police department cremated the body after completing all the formalities and the post-mortem examination. There was no lack of coordination between the two police districts, he claimed. * The residents say the district police should have circulated photographs and details of the boy to all the police districts. In case the accused had tried to take the boy out of Amritsar instead of killing him, he could have been saved. The accused who were not even professional criminals were clever enough to hoodwink the police by using different mobile sets and SIM cards to call the father of the victim Sunil Arora. 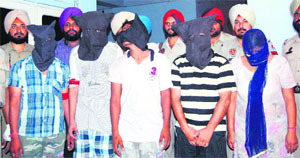 "Every time the kidnappers made a call, they used a new mobile phone and SIM cards procured on fake identity proofs," said police commissioner RP MIttal. The mobile phones were found to be stolen. This raised the hopes of the police that they could trace the child as the accused were not professionals, he added. The crime admitted to by the accused brought more mind-numbing pain to the parents. "I could not have imagined even in my wildest dreams that Prince who was our immediate neighbour would commit such a heinous crime. My son was very friendly with him," said Sushant's father Sunil Arora. "I shiver at the thought of the suffering my child had to go through in the end," said an inconsolable mother Komal. Sunil Arora was numbed into silence, finding it difficult to answer media queries. His relatives narrated the gruesome details of the kidnapping and murder while finding it very difficult to console the hapless parents. One of the accused belongs to this area and was instrumental hatching the conspiracy. According to the police sources, he provided stolen mobile phones used in the crime. "It has become common that criminals from Angarh indulge frequent brawls with the residents of Gate Hakima. They often barge into shops and beat up people," said Banarsi Das, an elderly resident of the area. He said his family was planning to shift from the area. Women residents of the area are even more worried about the safety of their families especially their children. "The children used to play in the streets and in the nearby park. Now I would not allow my children to play outside or go anywhere alone, said a resident. Another woman said it is difficult to even trust neighbours, whom we keep even before our relatives, but after this shocking murder we cannot even trust them, she said. Amarjit Singh Bhatia, area councillor said though Angarh held the police responsible for failing to control anti-social elements or stop drug trade from here. I would urge the authorities to depute regular police patrolling and nab the accused involved in various crimes in the area. Six teams comprising Sub-Divisional Magistrates and DSPs conducted simultaneous raids late in the evening in the villages adjoining the Ravi rive; Khanewal, Raipur Kalan, Sarangdev (Ajnala), Channa, Kot Razada (Ramdas). In Sarangdev village, the team enquired the constable on duty about the alleged illegal mining activity but the constable denied the same. Not satisfied with his reply, the team conducted a search and found that nearly 25-feet deep mining of san was being done on private land. It was also found that the land was not given on contract for sand mining and the constable on duty was allegedly hand-in-glove with the miners. DC Rajat Aggarwal said though those indulging in illegal mining are absconding but the police has registered a case against Sher Singh, the owner of the land under Section 379 of the IPC and Section 21/4 Mines Act 1952 as well as under the Damage to Public Property Act. He said the constable allegedly involved in covering up the act was suspended on the spot. The team also confiscated six trucks full of sand, two tractors and two trollies besides other equipment from the spot. The play deals with a lot of issues like violence, anti-war sentiments, fight for freedom and the sacrifices expected from women in the name of religion and family. “In our society, all the morals apply to women only, whether they are willing or unwilling to do so. Gandhari, in the play, stands for all these issues and her fight against the power-system while remaining indifferent. Being forced to marry a blind man, her choice to remain blindfolded was not a sacrifice but a protest to violation of her right as a woman,” says Arvind Gaur, the director of the play. “Gandhari in many ways reflects the position of women in contemporary society as well. “It is physically and mentally taxing for an actor but I love doing it for my audience,” says Aishveryaa. Playing 16 different characters in the one hour play, Aishveryaa has been the face of Indian culture in Australia. Nominated for the Best Actress Award in ‘Short & Sweet’, the biggest festival of 10-minute plays in the world, for her powerful performance in ‘Mandragora’ and recipient of Bronze artist award, the actor has been promoting Indian culture in Australia. Horticulture experts from Punjab Agricultural University, who are on their visit to the Golden Temple to revitalise the three sacred trees --- 'Ber Baba Budha Sahib', ‘Dukh Bhanjani Beri' and 'Illaichi Beri', advised devotees against touch these trees with greasy hands. The team comprising Dr Paramjit Singh Aulakh, HoD (Horticulture), Dr Desraj, both from PAU, Ludhiana, and Dr Narinder Pal Singh, PAU wing, Amritsar, earlier got the branches of infested shoots pruned and sprayed insecticides. These beris are considered to be over four-century old. 'Ber Baba Budha Sahib' is associated with Baba Budhaji, the first head granthi of the Golden Temple and is one of the oldest ber trees considered to be over 450-year-old. 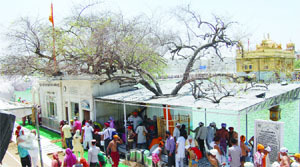 Showing concern over the health of the beris, experts viewed that the main culprit is the ghee of the 'karah parshad' as devotees do not refrain from touching these trees with greasy hands after partaking of the parshad. They also throw a variety of things under the tree as a matter of faith. The end result is that it clogs the access of tree sap which further dries these up for want of nutrition," they said. Another cause of concern was the lac insect, which has infested these holy trees. "It has been observed that these beris have been heavily infested with lac insects and require more trimming. But deep religious sentiments of devotees compel us to do minimum trimming and we do it accordingly," said Dr Desraj. A ber tree is known to live for about 100 years, but these trees have lived four times the expected age. Dr Aulakh said a special schedule has been chalked out well in advance to take care of holy trees. "We have chalked out a programme to spray insecticides thrice a year. Pruning along with the spray treatment is meted out to the beris in the months of May/June, July/August and October," he said. At present, the ditch machines have been pressed into service to lift the burnt material. One search opens a whole world of eat-healthy-loose-weight mantras. A ‘1500 calories diet plan’ that requires you to eat 1,500 calories every day to look slimmer; ‘Summer Shots’, a 3-week diet plan; a very militarised version of ‘Get Lean’ diet or the celebrated ‘Suzanne Summers’ diet plan. Each promises a lighter and fitter version of you. While summers are considered as the best time to lose weight, these popular diet plans have become a trend of sorts since Atkins diet. The West has exported us some keepers in baby food diet, Volumetrics and Jenny Craig diet plans, but which is the right one for you? Call them fad diets or meal replacements, the diet plans seem to be working hard on the waistline. Some of the popular diet plans from Diet Mantra, a clinic for diet consultant by fitness guru Namita Jain, have been The Countdown Plan, Disease Management plan and Detox Plan. “Our popular diet plans not just focus on weight loss, but also fitness amongst those suffering from some medical problems and general body cleansing,” she says. “No two people are the same, so their dietary requirements are also different. 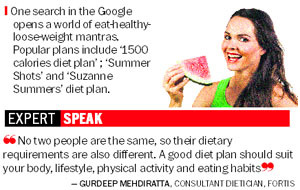 A good diet plan should suit your body, lifestyle, physical activity, eating habits et al,” says Gurdeep Mehdiratta, consultant dietician, Fortis. Though, she doesn’t outright reject their effectiveness. “These diet plans act as guidelines towards adopting healthier lifestyle, but should not be followed strictly. Bring gradual changes in your diet for long-lasting results,” she advises.